GT-Xsatellite Dynamic ( Receiver) should be mounted according to the installation guide. Each receiver is supplied by normal DC-power 14-24 V DC, or if model trains use also from DCC on track. A new receiver should be calibrated together with the other receivers according to the installation guide. In the calibration process you decide whether to use the long og the short range mode. 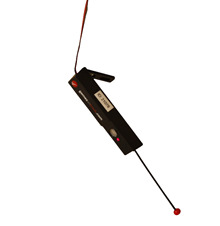 One receiver uses max 30 mA and covers up to 15 meter distance depending on visibility and sending power. Normally mounted in the ceiling. With normal calibration up to 10 mm precission. Can be used together with other 1302810, 130811, however in one scenario all satellites must be either long or short.